At the next signal light, drive straight into the Gilman Parking Structure. Park in any open Visitor parking spaces and purchase a parking permit (see below) from one of the parking kiosks. 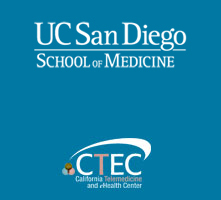 Walk across parking lot P602 and the ceremonial green lawn to the Medical Education - Telemedicine (MET) building. In the main MET quad, take the elevator/stairs to the lower level. The Telemedicine classrooms are located in the main lightwell corridor opposite the elevators - Rooms LL152 & LL154. The Medical Education-Telemedicine (MET) building is shown as the "Telemedicine" building in the Visitor map (Bldg #845). Click to ZOOM in on the School of Medicine to identify the specific buildings and the Gilman Parking Structure (Bldg #783). You can also SEARCH for the building in the left column to locate it: click Buildings > School of Medicine > Medical Education and Telemedicine. A parking permit is always required Monday through Friday at all UCSD parking lots. While there are	a limited amount of parking spaces near the Telemedicine building, attendees are recommended to park in the Gilman Parking Structure (read the "Pay Station permits" section). Single day parking permits are $16 and can be purchased from any Permit Pay Station inside the Gilman Parking Structure. The Permit Pay Stations accept exact cash, Visa, Mastercard and American Express.